Gudmunder Bragason of Sónar emerges from Rejkavik harbour covered in ice after the successful Kru lifejacket/ R10 demonstration. Ocean Safety training for ICE-SAR and Sonar in cold Icelandic waters. The UK’s largest independent marine safety equipment supplier, Ocean Safety, has just completed a chilly training session to safety authorities in Iceland in conjunction with the company’s Iceland service agent Sónar EHF, to demonstrate vital life saving equipment manufactured by the company. Andy Bracewell, Export Manager at Ocean Safety, led a team which demonstrated the capabilities of the Kannad SafeLink R10 AIS Survivor Recovery System (SRS) to service technicians at Sónar EHF, based in Reykjavík. Also present at the demonstration were senior personnel from ICE-SAR (full name Slysavarnafélagið Landsbjörg), the Icelandic sea survival and safety authority. The main objective was to demonstrate how the indispensible R10, which works by sending a message to nearby AIS receivers in the event of an emergency, can be fitted to the Ocean Safety Kru range of lifejackets, including the Kru Falcon, manufactured for demanding conditions. 25 members of the Icelandic Fishing and Rescue departments also attended the Ocean Safety demonstration, which took place on board the Saebjorg training vessel in Reykjavík harbour in very difficult weather conditions. 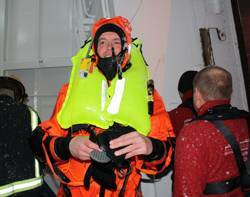 An actual in-water scenario was carried out in the icy waters when Sónar’s Gudmunder Bragason donned his survival suit complete with Ocean Safety Kru Professional lifejacket fitted with the R10 AIS, and then jumped in. The life jacket inflated, activating the Safelink R10 AIS. The alarm signal, both audio and visual appeared on screen within 5 seconds of activation giving precise target survivor information. All members of the ICE-SAR and fishing departments were very impressed with the demonstration and have requested further information from Sónar EHF for Ocean Safety’s R10-ready lifejacket range. The Saebjorg is one of a fleet of training vessels belonging to ICE-SAR which provides safety courses for between 1200 – 1500 Icelandic seafarers each year and is the only survival training centre in Iceland. All commercial seafarers including fisherman are mandated under Icelandic law to undertake the ICE-SAR training courses. Sónar EHF serves the busy commercial maritime industry in Iceland, predominantly the fishing sector. Sónar is the official Ocean Safety Lifejacket service station in Iceland and personnel are now fully trained both in sales and service for the full Ocean Safety range.